Top producing real estate broker Lisa Turnure brings extensive experience to the luxury residential real estate market in the greater Seattle area. She combines seasoned expertise and innovation, with unwavering tenacity, dedication, class, integrity and an enthusiastic, positive personality that makes her a pleasure to work with, resulting in long-standing client relationships built on trust and confidence. Lisa brings a refreshing level of professionalism to real estate. With a background in business including CPA certification and a degree from the University of Washington in Marketing and Finance Lisa’s educational background is ideal for the real estate industry. Formerly CFO of an internationally recognized Strategic Branding and Design firm, Lisa draws on her experience in finance, contracts and marketing in approaching her business. As a top-level, award winning Realtor®, Lisa specializes in representing sellers and buyers in Madison and Washington Park, Denny Blaine, Broadmoor, Capitol Hill, Downtown, Queen Anne, Magnolia, Laurelhurst and Windermere. A Seattle native, Lisa grew up in Bellevue and also has strong knowledge of the eastside communities as well as Mercer Island. Her representation of Sellers and Buyers spans a wide range of clientele that include first-time home buyers, move-up buyers, executive relocation, real estate developers, high net worth individuals, entrepreneurs and investors. Acknowledged for her track record of success, negotiation skills, world-class client service, unsurpassed discretion and confidentiality, excellent communication skills, global network and marketing expertise, Lisa consistently delivers best-in-class results for every Buyer and Seller she represents. Whether you're looking for your dream home or selling your current property, Lisa Turnure is your preeminent resource for all of your real estate related needs. Real estate is not just Lisa’s career, it is her passion. 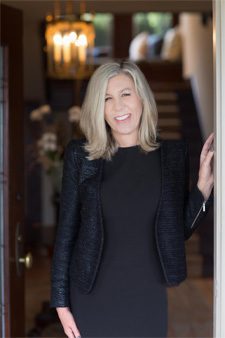 Top producing real estate broker Lisa Turnure brings extensive experience to the luxury residential real estate market in the greater Seattle area. She combines seasoned expertise and innovation, with unwavering tenacity, dedication, class, integrity and an enthusiastic, positive personality that makes her a pleasure to work with, resulting in long-standing client relationships built on trust and confidence. Lisa brings a refreshing level of professionalism to real estate. With a background in business including CPA certification and a degree from the University of Washington in Marketing and Finance Lisa’s educational background is ideal for the real estate industry. Formerly CFO of an internationally recognized Strategic Branding and Design firm, Lisa draws on her experience in finance, contracts, and marketing in approaching her business. As a top-level, award-winning Realtor®, Lisa specializes in representing sellers and buyers in Madison and Washington Park, Denny Blaine, Broadmoor, Capitol Hill, Downtown, Queen Anne, Magnolia, Laurelhurst, and Windermere. A Seattle native, Lisa grew up in Bellevue and also has strong knowledge of the eastside communities as well as Mercer Island. Her representation of Sellers and Buyers spans a wide range of clientele that includes first-time home buyers, move-up buyers, executive relocation, real estate developers, high net worth individuals, entrepreneurs and investors. Acknowledged for her track record of success, negotiation skills, world-class client service, unsurpassed discretion and confidentiality, excellent communication skills, global network, and marketing expertise, Lisa consistently delivers best-in-class results for every Buyer and Seller she represents. Whether you're looking for your dream home or selling your current property, Lisa Turnure is your preeminent resource for all of your real estate related needs.